How Did You Get All That Brick Up Here? I just wanted a new look to my bedroom. Yes, I say “my” bedroom, as my husband knows 1) I can’t be stopped when I have an idea, and 2) it’ll usually turn out better than we both envision. My hands do the talking for me. My mouth just gets me in trouble. It’s quick. Set the stage and start the process on Day 1. Paint and clean up on Day 2. 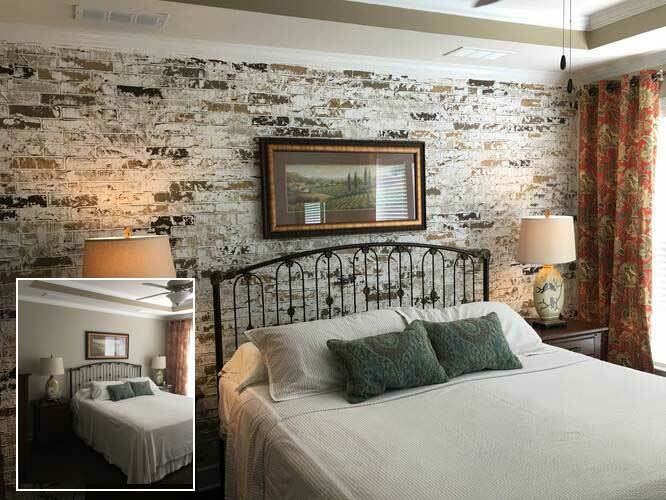 I was so delighted with how my bedroom turned out, I showed it to my friends, and the first question they would ask is, “How’d you get all that brick up here?” Because it really does LOOK – and more importantly FEEL – like real brick. They were really impressed when I told them the truth. It’s not brick, just an artistic vision brought into reality. Some of my friends hired me to do some work in their homes, and word kept spreading. So I thought…hmmm…let’s get this business rolling.